Lucky Nana is bringing you to lunch with her friends and then taking you over to the school. You did visit me today, so you could trick or treat with the preschool kids at our parade, so I didn’t get too jealous. Kaylee, make sure mommy reads “It’s The Great Pumpkin, Charlie Brown!” to you. It is one of her favorite Halloween memories. 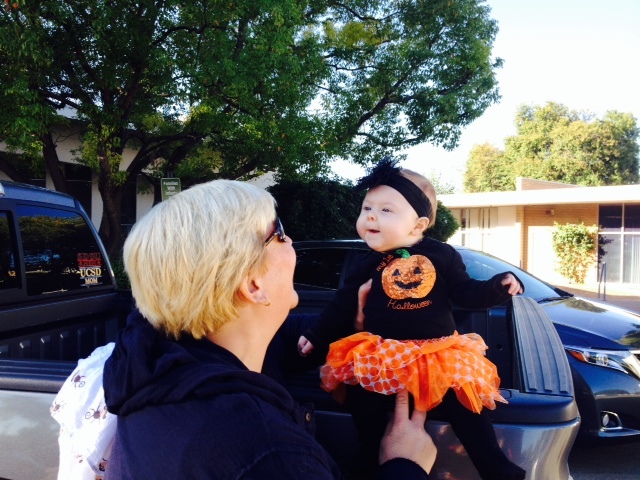 My favorite part of Halloween today was, of course, kissing you on the cheeks over a dozen times. This is like taking vitamins and your cheeks are my daily allotment. So, no matter what candy I eat today, you will still be the sweetest treat!